A - Connectors: A battery charger connects to the Beast through these electrical sockets and charges two 12-volt batteries which are used to fire the ignitors that start the engine. B - Oil Pressure: The jet engine only has three bearings. These bearings enable the engine to rotate at speeds up to 13,500 RPM (revolutions per minute). The oil pressure gauge indicates whether there is enough lubricant on the bearings to prevent engine failure. 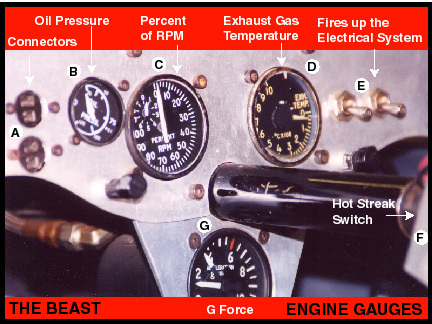 C - Percent of RPM: This gauge indicates how fast the engine is rotating. When the Beast departs "full throttle" from the starting line, the big needle hits 100 on the dial. D - Exhaust Gas Temperature: Indicates the temperature of the exhaust gas. Ideally it should operate at 500 degrees Celsius (centigrade) which is about 930 degrees Fahrenheit. If the engine overheats, engine failure can occur. E - Switches: These dual switches are used to fire-up the electrical system components; these components include the solenoids and the ignitor box (which fires two ignitors that function somewhat like spark plugs). F - Hot Streak Switch: This is a button on the steering wheel that is used to ignite the afterburner. G - Gravitational (G) Force: This gauge measures both positive and negative G Force. The driver feels 3-4 Gs during acceleration and 6 Gs during deceleration when the parachute is deployed.